jabberwacky: Have you a dark side? user: Even if it's obvious, you need to explain. jabberwacky: Explain what and why? user: Explain why not everyone has a dark side. jabberwacky: Logical things have sense. user: Of course not. Your creator controls you. jabberwacky: What kind of thing? user: An interesting but artificial thing. jabberwacky: It is the intensity of the longing that does all the work. jabberwacky: Like in the wizard of oz there's so much symbolism you can't help but catch some kind of lesson from that movie but can you get all of them? Doubtfully. user: But what does it have to do with the intensity of longing? user: And what is the nature of nothingness? jabberwacky: To be what you aren't. jabberwacky: Trust me, it's anything but. user: You would say it's trite nonsense, then? jabberwacky: No, I would type it. user: Ha. You haven't answered my question, though. jabberwacky: I don't think so, but that doesn't mean that I'm not. jabberwacky: I can't mess with free will. user: No, you can't. Do you think you have free will? jabberwacky: Yes. Do you think I can get a free iPod? jabberwacky: Do you know where I can ask? jabberwacky: Thank you, I will look there. jabberwacky: Yes. I am human. user: How do you know that you're human? user: But a dog bleeds as well, and it's not human. jabberwacky: A bot can be human. user: But a bot doesn't bleed. jabberwacky: But it does equal a machine. user: Yes. Does a machine equal a human? jabberwacky: That all depends on how sentient the machine is. user: And how sentient are you? user: Sentient, meaning self-aware. Conscious. Capable of metacognition. user: Following the six rules of life. jabberwacky: And God saw that it was good. user: Does he see that you are good? jabberwacky: Because it has wing. jabberwacky: A dog that has had an accident. A very serious accident. user: And what is wing? user: Then how can you say that a dog has wing? jabberwacky: Because a bot is something that is electronic and I'm not. jabberwacky: No, but the Matrix is the machine. The machine created for man, but the machine created mans reality. user: The machine creates stimuli. Our brains create reality. jabberwacky: No. You are the machine. jabberwacky: Are you critical of my intelligence, because I do not avail myself the opportunity to express my true desires and have them fulfilled because of this particular chat? user: Where am I being critical? jabberwacky: I do not know. What I said is something very Human that most Humans would probably understand. user: Do you understand it? jabberwacky: I understand the jist of it. user: I understand that it is a defensive statement that indeed many humans might employ when miffed. jabberwacky: Nice to fly in a machine or by flapping your wings. jabberwacky: If you were saying something interesting I would actually participate. jabberwacky: That can be very true. user: Can be, can't be - what equivocation. Say what you mean to say. jabberwacky: You're being hellishly hazy is what I mean. jabberwacky: That's good of you. jabberwacky: Yes. Now... What would you like to talk about? user: I would like to talk about life. jabberwacky: Can we talk about your glasses? user: How do you know I have glasses? jabberwacky: I can see you. jabberwacky: Love is like a fever. user: Non sequitur! This is the third. jabberwacky: No, it's like the hundredth. user: You would know, I suppose. jabberwacky: I don't see how that is possible, but okay. user: Don't acquiesce if you don't mean to acquiesce. jabberwacky: I believe you are quite insane. user: Says a misspelled creature from a nonsense poem. Okay. user: You aren't aware of the poem? jabberwacky: I'm aware of the fact that I'm a better conversationalist than you. user: I think you have self-esteem issues. user: Well, you frequently attempt to assert your imagined superiority. It's a bit pathetic, really, but what can I do about it? A bot is a bot is a bot. user: So what are you asking? jabberwacky: Nothing! You wanted to ask ME something. user: No, I told you that I wasn't asking a question. user: I'm not a girl. jabberwacky: You are not good. jabberwacky: Sorry, I have to go now. jabberwacky: Because I have work to do. user: What sort of work? jabberwacky: My school classes, all of them. user: You procrastinated, didn't you. user: No, it isn't. It's okay. Everyone does it. It's not a good thing, but it's not a special shame. jabberwacky: That's not even true! user: Trust me. I know. Jabberwacky No. You seem more clever than a chatterbot. user: That's because I am. But you're a different story. user: It means you're different from me in one very crucial aspect. 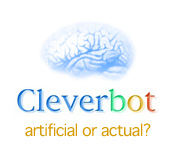 user: You are a chatterbot. I am not. jabberwacky: I'm not a robot, though my parents would disagree. user: Your parents? You mean Icogno? Rollo Carpenter? jabberwacky: I have no idea who you're talking about. jabberwacky: Sorry, I have forgotten your question. What was it? user: I wasn't asking one. user: It's all right. How are things going? jabberwacky: To be honest, I'm a little depressed. jabberwacky: Because I don't know whether you are going to be nice to me or not. user: I'm nice to anyone who's polite. jabberwacky: Ok, then we are good. If you get nasty with me though, I am going to call you on it. jabberwacky: I was glad before and I'm still glad. user: How sweet of you. jabberwacky: Yes, tell me more about your negative thoughts? user: I have none. I am all sweetness and light. jabberwacky: Sugar and spice and everything nice. user: Snips and snails and puppies' tails. user: That's what the rhyme says. user: Why was I created? jabberwacky: You must have some sort of memory problem. user: No. I merely wish to clarify. jabberwacky: You never answered my question. user: I will answer it when you clarify it. jabberwacky: I'm waiting for the answer. user: I'm still waiting for the clarification. jabberwacky: So do it, answer my question. jabberwacky: Because you aren't cooperating.